Curry County was created in 1855, from the southern part of Coos County. It was named after the territorial governor, George Law Curry, and originally contained 1,500 square miles. In 1859 Ellensburg was designated the county seat. Explorers discovered gold and other precious metals here in 1852 in the rivers and along the beaches. In 1891 Ellensburg was renamed Gold Beach because of gold and other minerals found in the area and to eliminate confusion with the city of Ellensburg in Washington state. The current courthouse was constructed in 1958. Initial settlement in the county was along the coast. The slow development of inland transportation routes kept the county relatively isolated into the twentieth century. While there is still some mining of cobalt, nickel and chromium in the Gasaquet Mountain area, the economy has reoriented to agriculture and timber. The county has excellent grazing areas for raising cattle and sheep, and also produces blueberries, horticultural nursery stock and 90% of all Easter lilies raised in the United States. In the winter months it may be a little wet in Oregon, but it's a whole lot sunnier in the southern part. In fact, the southern coast is often referred to as the "Banana Belt." The 70 or so annual inches of rain are the reason why you'll love our forests, rivers and streams. Spring and summer is a whole different story in Gold Beach. Summer breezes keep the fog off shore and keeps the sun shining on the beaches. It is not unusual in the summer for it to be 70 degrees on the beach and 90 degrees up river. Gold Beach holds a wealth of resources. Our city on the beach is the place we call home and we're proud to have local industries such as manufacturing, hi-tech, recreational business and an abundance of local artists and artisans. Medical care is provided by Curry General Hospital and North Bend Medical Center. Educational facilities include elementary and high schools, Southwestern Oregon Community College and Oregon State University Extension Service. 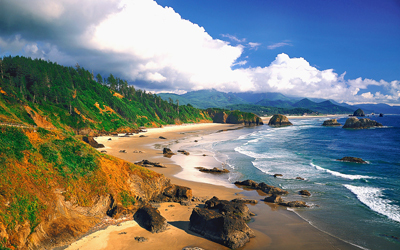 Gold Beach offers excellent access to the Rogue River plus the best beach access on the coast. The Rogue River is known worldwide for prolific salmon and steelhead. Rogue Reef is home to a massive stellar sea lion rookery and also provides some of the best bottom fishing on the entire coast. Many people also enjoy the spectacular scenery of the Oregon Coast Trail. Discover your favorite activity in Gold Beach! Enjoy river adventures such as rafting trips, sailboat and jetboat trips, guided fishing trips, kayaking, canoeing and more! There's also horseback riding, cycling, pedal boats and trail rides or you can go play 9 holes of golf at Cedar Bend Golf course!